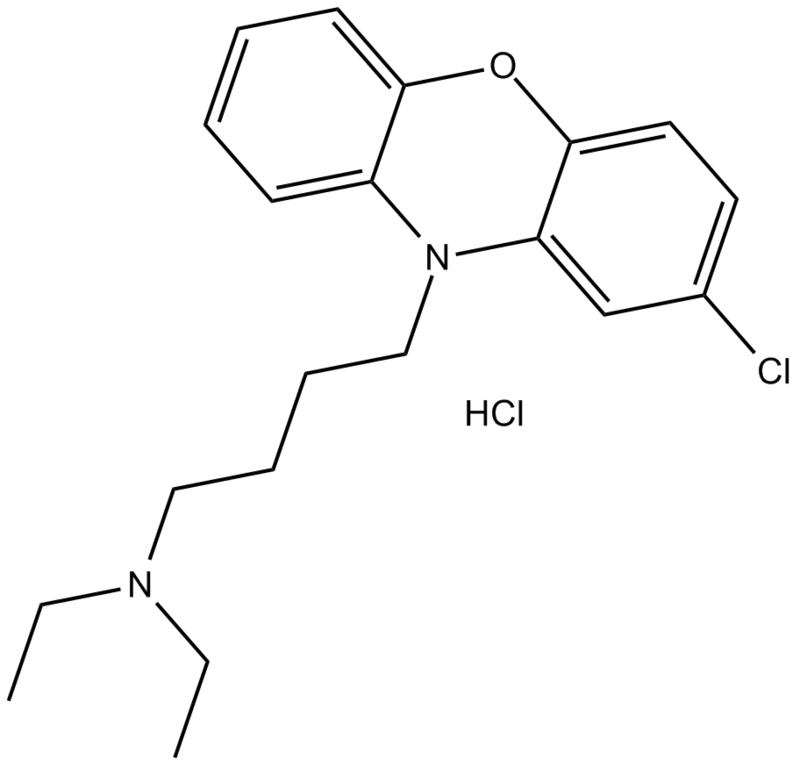 10-DEBC hydrochloride is a selective inhibitor of Akt (or termed PKB) , with an IC50 value of approximate 48 μM . Akt is a type of serine/threonine kinase. It phosphorylates and inactivates components in the apoptotic machinery, including Caspase 9 and BAD. Akt phosphorylates and inhibits a Forkhead transcription factor, and hence promotes cell survival . As demonstrated by LDH and MTT tests, 10-DEBC dihydrochloride at 10 μM did not affect cell viability when it was applied alone. 10-DEBC dihydrochloride at this concentration in cisplatin-treated U251 cells abrogated the cytoprotective effect of metformin. 10-DEBC dihydrochloride showed neutralization effect on the antiapoptotic activity of metformin, increasing the cell membrane phosphatidylserine exposure and DNA fragmentation to the levels observed with cisplatin alone. In U251 cells, 10-DEBC dihydrochloride significantly induced the production of reactive oxygen species. In cisplatin-treated cells, 10-DEBC dihydrochloride consequently reduced the antioxidative effect of metformin . Studies in effects of 10-DEBC hydrochloride on BAT explants incubated with phentolamine were carried out. Without any effect on total Akt protein, 10-DEBC hydrochloride inhibited the phosphorylation of Akt Ser473 by ~40%. In WT explants, the 10-DEBC hydrochloride alone had no effect on the phosphorylation of Ser485/491 of AMPK, and did not affect the phentolamine effect. However, in β-AR KO explants, 10-DEBC hydrochloride blunted the AMPK Ser485/491 phosphorylation increased by phentolamine .
. Janjetovic K, Vucicevic L, Misirkic M, et al. Metformin reduces cisplatin-mediated apoptotic death of cancer cells through AMPK-independent activation of Akt. European journal of pharmacology, 2011, 651(1): 41-50.
. De Abreu LA, Calixto C, Waltero CF, et al. The conserved role of the AKT/GSK3 axis in cell survival and glycogen metabolism in Rhipicephalus (Boophilus) microplus embryo tick cell line BME26. Biochimica et Biophysica Acta (BBA)-General Subjects, 2013, 1830(3): 2574-2582.
. Brunet A, Bonni A, Zigmond MJ, et al. Akt promotes cell survival by phosphorylating and inhibiting a Forkhead transcription factor. cell, 1999, 96(6): 857-868.
. Pulinilkunnil T, He H, Kong D, et al. Adrenergic regulation of AMP-activated protein kinase in brown adipose tissue in vivo. Journal of Biological Chemistry, 2011, 286(11): 8798-8809.